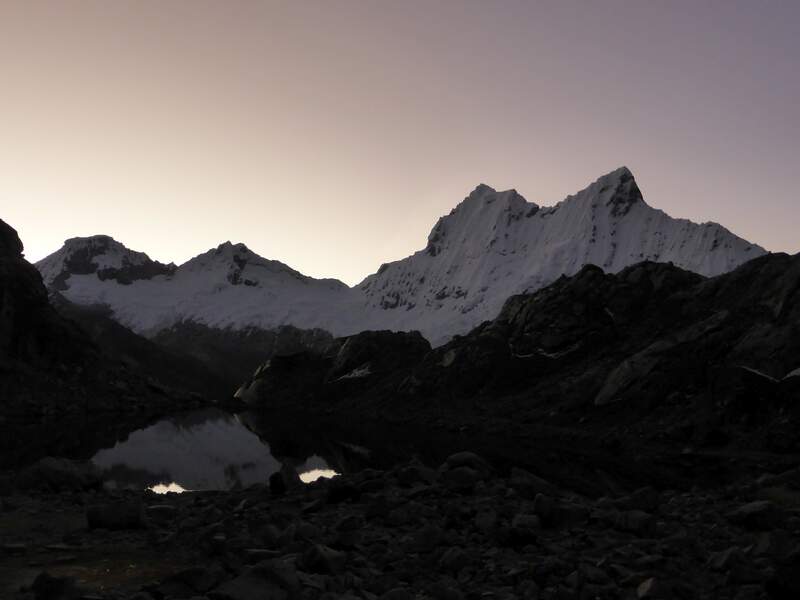 Yanapaccha at dusk from the moraine. 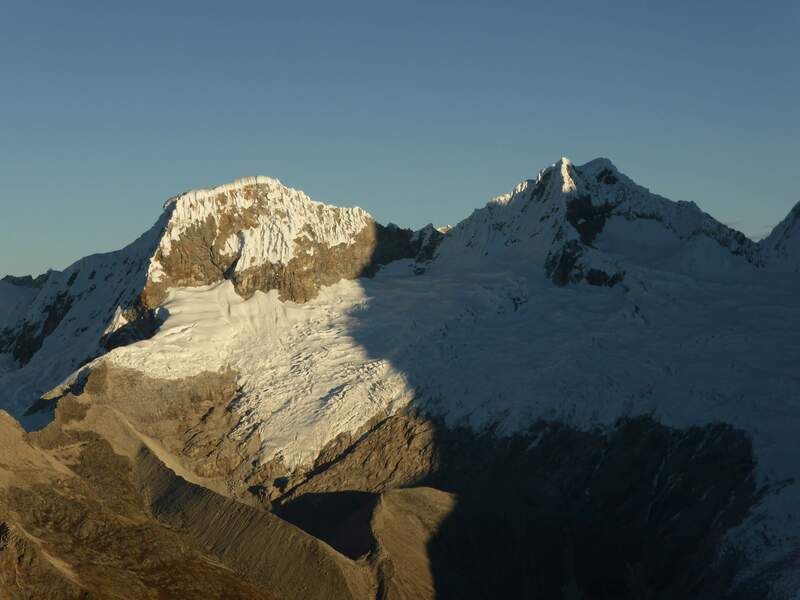 After success on two of Peru’s easy 5000m peaks, Ishinca and Pisco, success on the technical and gorgeous 6000m Tocllaraju, a very disheartening, thwarted attempt on Chopicalqui due to lack of appetite and poor (not eating anything for three days while on the mountain) nutrition, and a 12 hour hotel-to-hotel single day visit to Huascaran’s unexpectedly-closed refuge in inclement weather, we found ourselves with only three climbing days left in Peru. I had struggled to get enough calories down throughout the trip while at altitude, and while happy with the variety of mountains we’d visited so far, wanted to get onto another technical mountain. 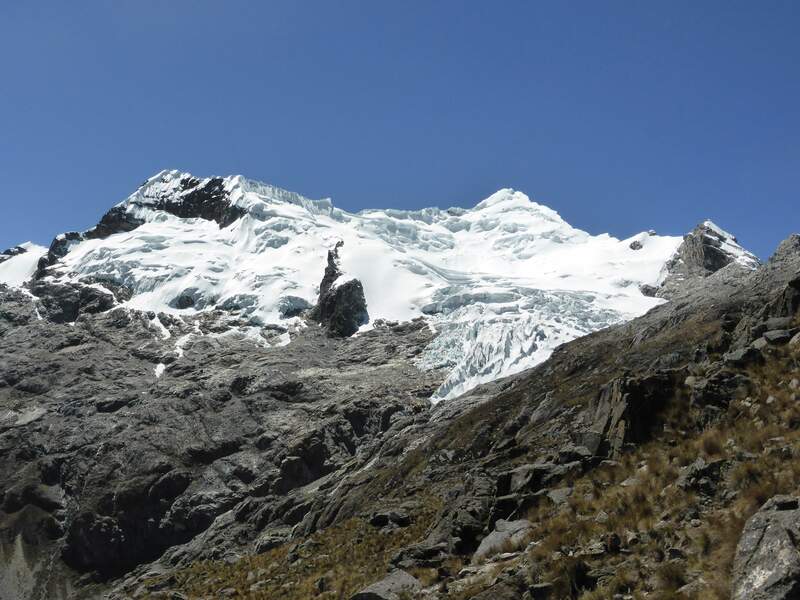 Yanapaccha and it’s enormous glacier, as seen from the approach hike. 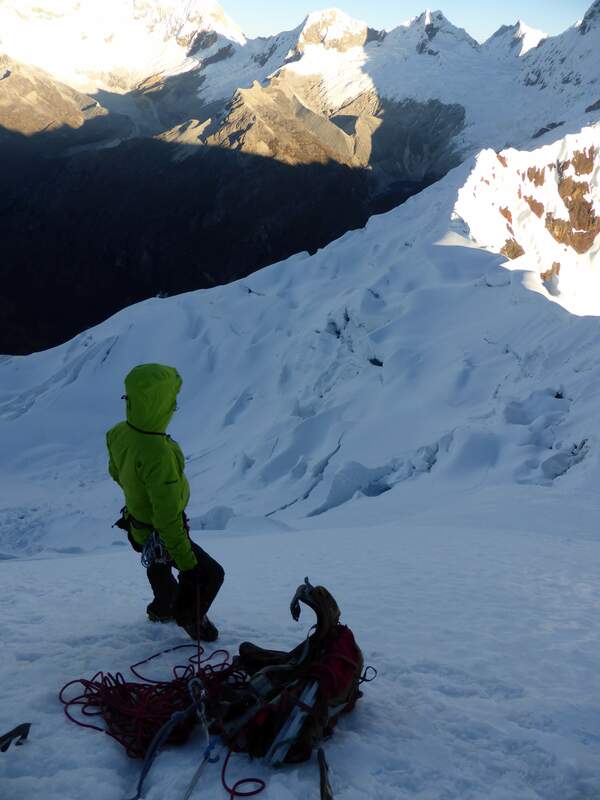 With no time to attempt another 6000m peak, and uncertain whether it would even be a good idea given my anaemic appetite, my partner and guide Edgar and I opened the guidebook in search of a technical 5000m peak. When we discovered that Yanapaccha was a rare exception to Peru’s typically lengthy and brutal approach slogs up, down, and over endless moraine fields, we were immediately sold on the idea of visiting and making an attempt. 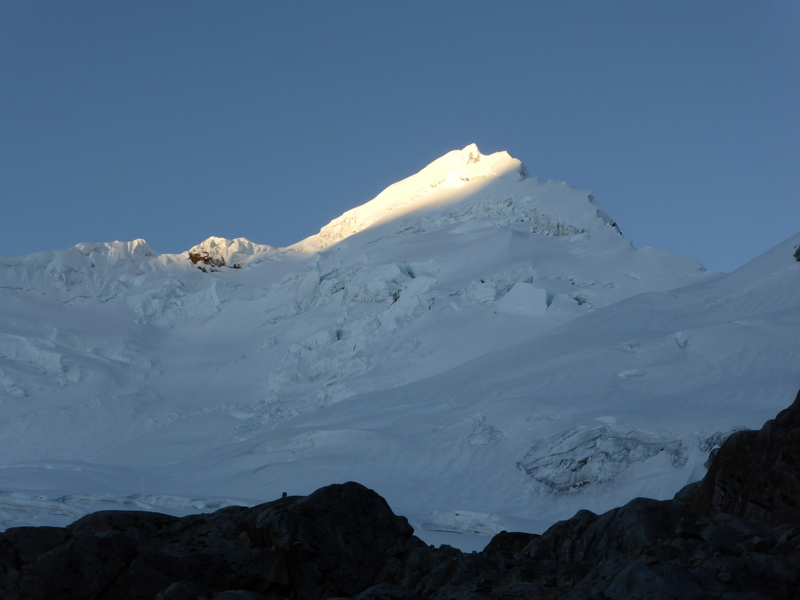 Yanapaccha is not a popular climb, likely due to the fact that it isn’t particularly high yet is technically a good deal more difficult than nearby Pisco. 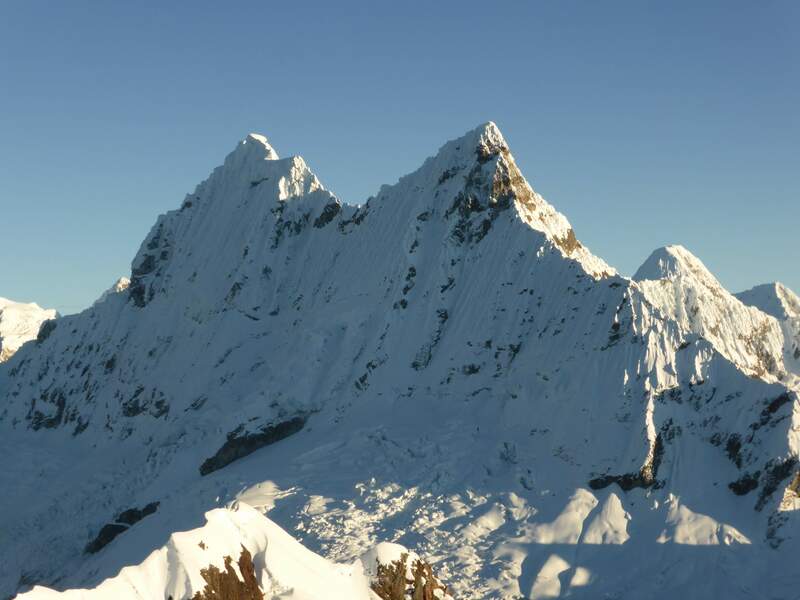 Regardless, a short and very moderate approach makes Yanapaccha highly accessible, and its large glacier sports some very nice terrain at around an AD difficulty. Day 1: We left Huaraz in a shared minibus headed for the Quebrada Llanganuco via Yungay, the same area used to access Huascaran, Chopicalqui, and Pisco. We continued past the access point for the Pisco approach, continued further still past the access point for the Chopicalqui approach, and followed switchbacks upwards to around 4650m where the approach to Yanapaccha begins at the side of the road. 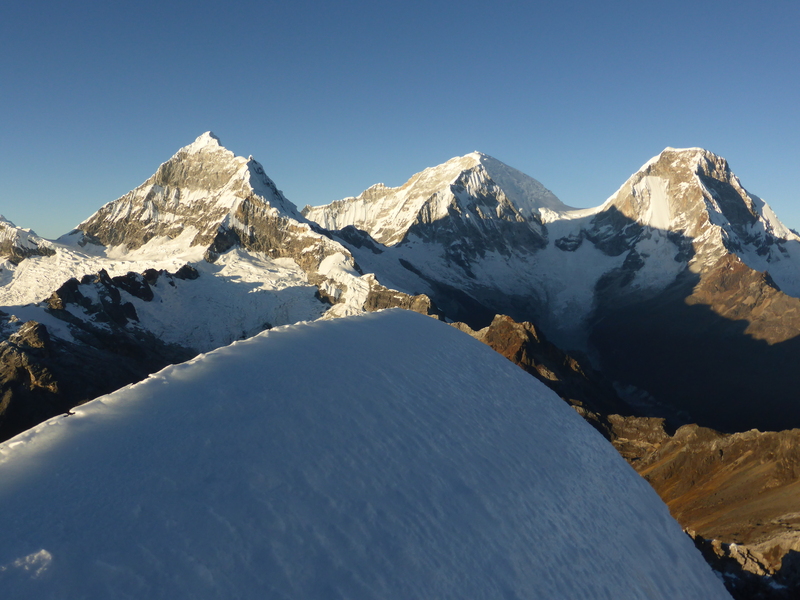 The views here were incredible, with numerous high peaks towering around us. 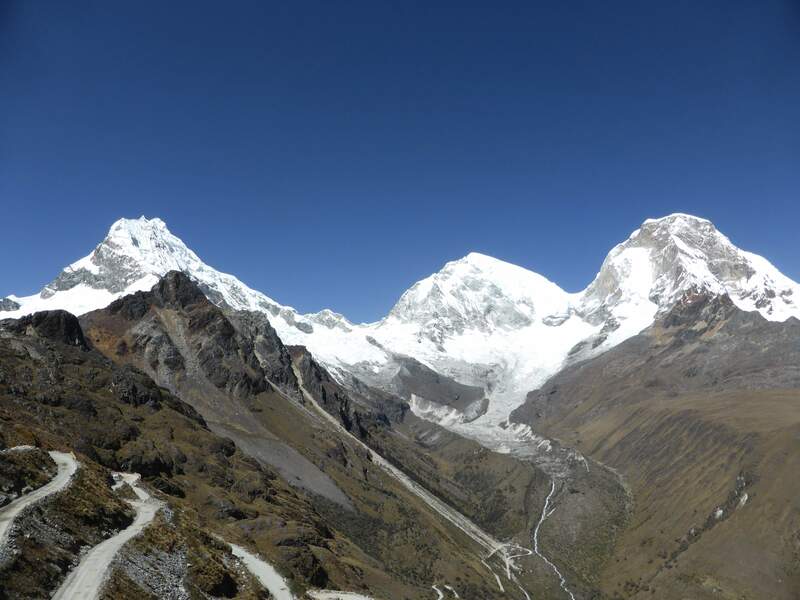 Chopicalqui, Huascaran Sur, and Huascaran Norte high above the Quebrada Llanganuco, as seen from the Yanapaccha approach access point. The approach hike was short with minimal altitude gain, and took us only two hours. The moraine camp below Yanapaccha’s glacier is an incredibly lovely spot, with clear views of Chacraraju above a pristine high-altitude lake. Yanapaccha, from near the moraine camp. July Sunset happens early in Peru, so we quickly put up our tent and made dinner. After dinner I spent some time socializing with a 6-person commercial team there to do an ice climbing and glacier skills course before leaving them to take photographs. The sunset cast lovely light over Yanapaccha, and highlighted Chacraraju and Pisco in the distance. Pisco and Chacraraju at sunset. Day 2: We woke up at 1:00, and were moving upwards by 2:00. From the moraine camp a short 15 minute scramble took us to the base of the glacier, where we put on crampons and roped up. The entry to the glacier involved a ~5 meter ~60 degree wall of thin water ice – a fine start to the climb! 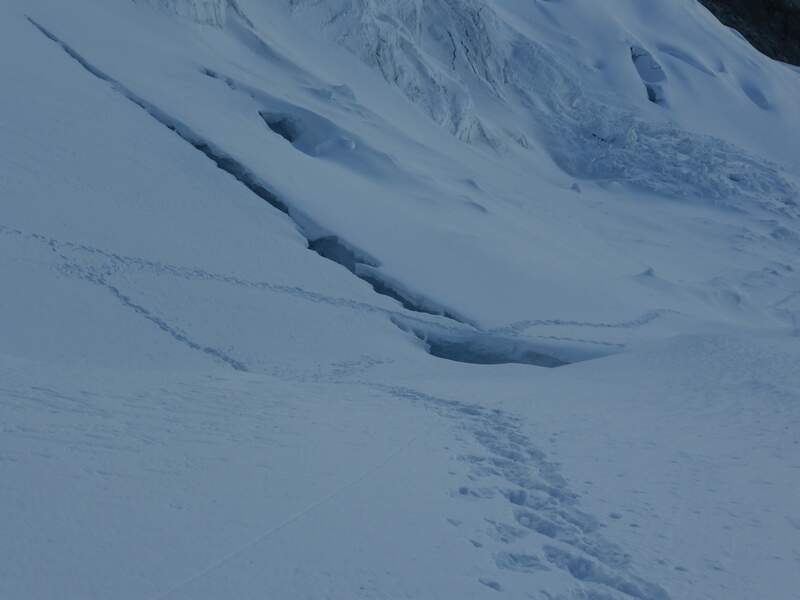 The lower glacier took us across moderate slopes before becoming more complicated. The boot track took us across a sketchy snowbridge, which we protected, and along a steep traverse below the summit pyramid before we reached the first of three pitches. It was very cold, and a light wind gave cause to layer up with my down parka and thick mitts. 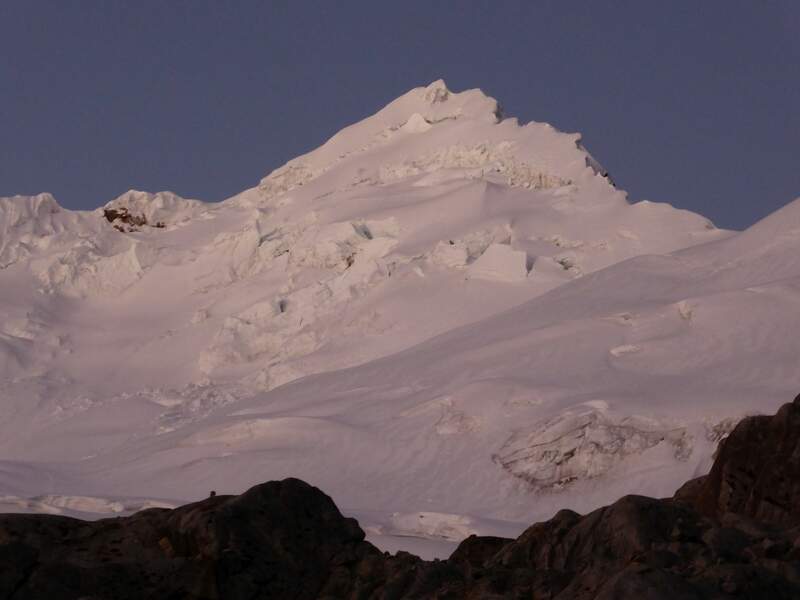 We favoured the ridge of the summit pyramid rather than an ascent directly up the face, due to a large crevasse open in the middle of the steep slope. 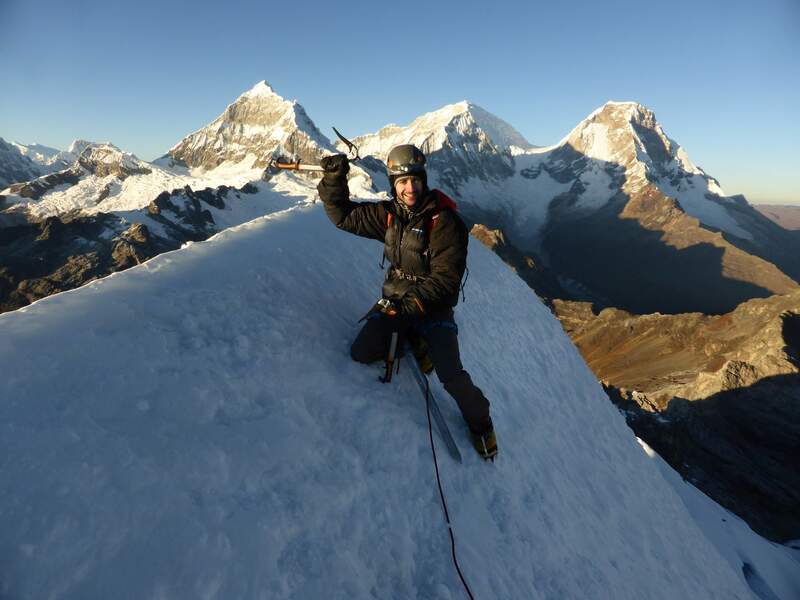 We climbed steadily and with purpose on belay, using snow pickets as anchors along the ~60-70 degree ridge. The final pitch was interesting, with several medium-sized crevasses splitting the slope and creating short but technical vertical steps. 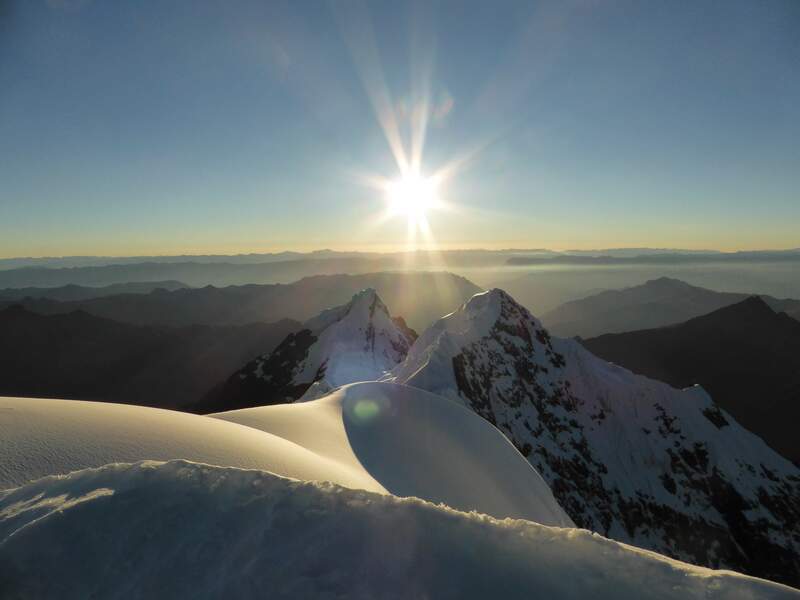 Soon we broke through a small cornice, and after another 10m of climbing reached the summit at 6:30 a.m., four hours after leaving our tent – and what a summit! The views from the top of Yanapaccha were nothing short of gorgeous. The Huascarans, Chopicalqui, the Huandoys, Chacraraju, and Pisco rose around us, and we enjoyed excellent angles of view towards all of them. Edgar on the summit of Yanapaccha. On the summit of Yanapaccha. 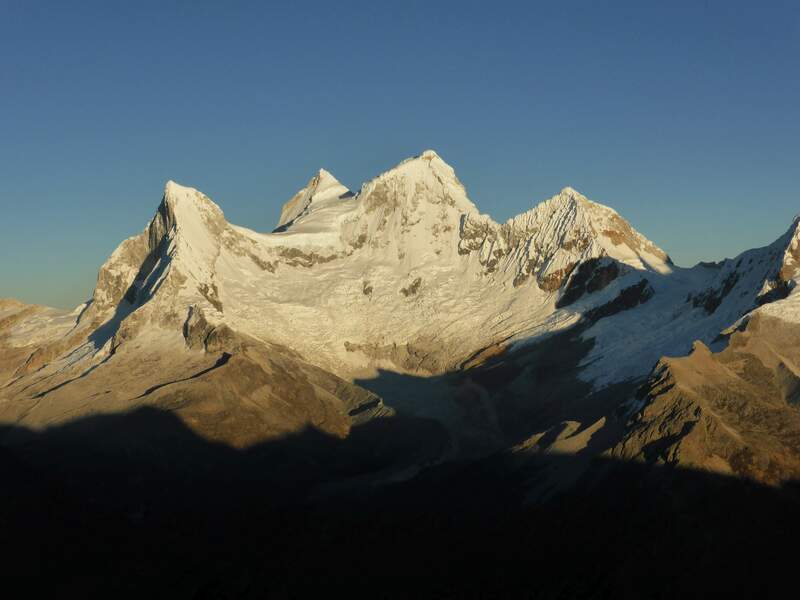 Chopicalqui, Huascaran Sur, and Huascaran Norte. Ahead of us the sun was rising over Yanapaccha’s secondary peaks. The morning light warmed us up, and put us into good spirits for the descent. We decided to leave the summit at 6:30. 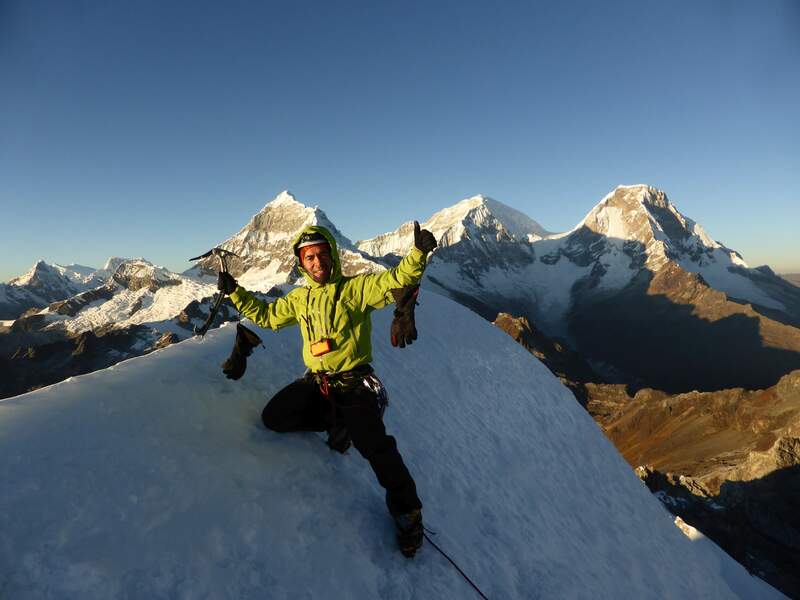 We found an anchor placed on the summit, and using it completed a first rappel directly down the face of the summit pyramid. There was no second anchor to be found on the face, so we sacrificed a picket and some gear to build a second rappel, which took us directly over the large crevasse in the face. I punched through a snowbridge on this rappel, but didn’t lose the slope or need to slow down. Looking down from Yanapaccha’s summit. We roped up and down-climbed the final pitch, carefully crossed the thin snowbridge using a picket for protection, and hiked across the long lower glacier back to the moraine. Very pleased with my performance on the technical pitches of the climb, I nonetheless managed to fall while descending the final ice-wall leading down to the moraine! Luckily we had decided to protect it with an ice screw, and nothing was damaged aside from pride. The thin, sketchy snowbridge we crossed on the lower glacier. We took the time to protect it carefully with a picket. Looking back at Yanapaccha from the top of the moraine. We reached the tent at 9:15, and packed up everything after having a light breakfast. We hiked out to the road in good time, taking roughly 1:45. Here we hitched a ride in the back of a truck down to the access point for Pisco, where we waited for an hour for an empty taxi to show up and take us back to Huaraz. Yanapaccha was an excellent climb. 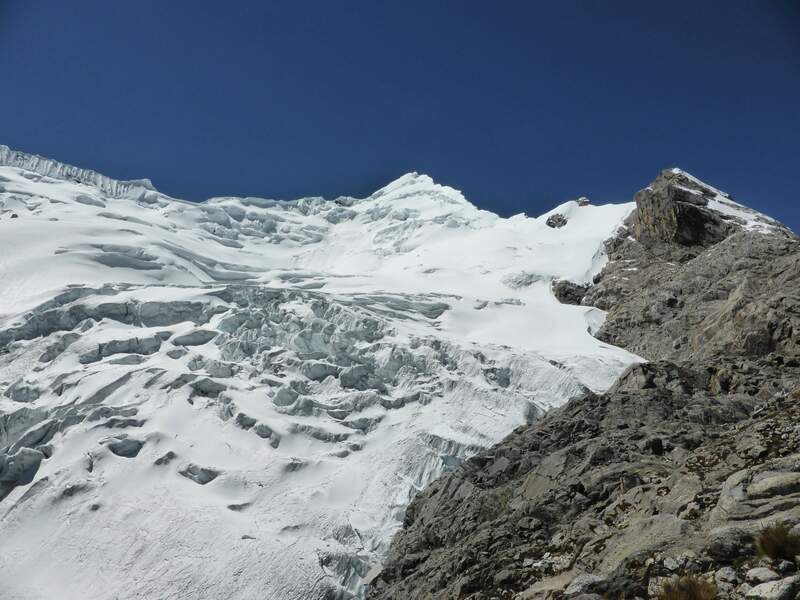 A short approach, beautiful campsite, relatively short climb, interesting glacier, and stunning summit views made the climb enjoyable and not overly demanding physically, while three technical pitches made it feel exciting, challenging, and worthwhile. 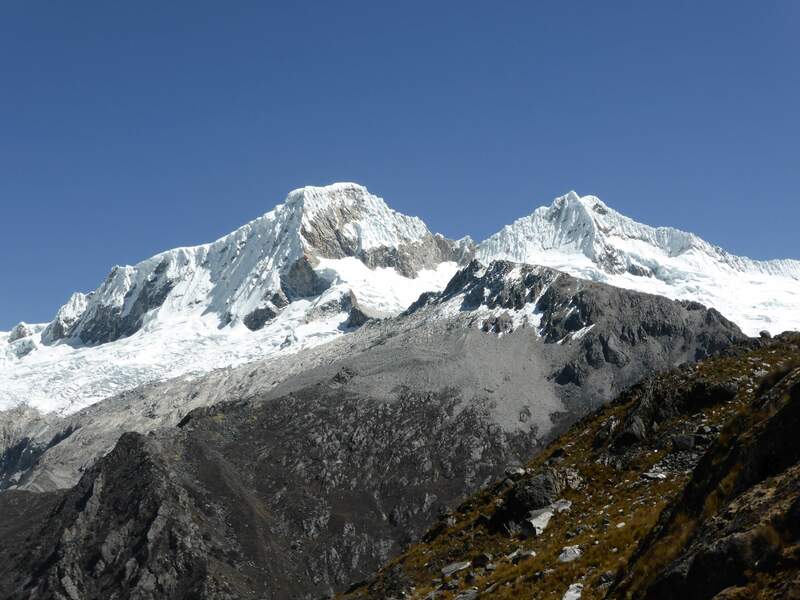 Were Yanapaccha a 6000m peak, I am certain that it would be one of Peru’s most popular climbs – alas, its diminutive (for Peru, anyhow) altitude is likely the reason it is a relatively unknown and seldom visited peak. 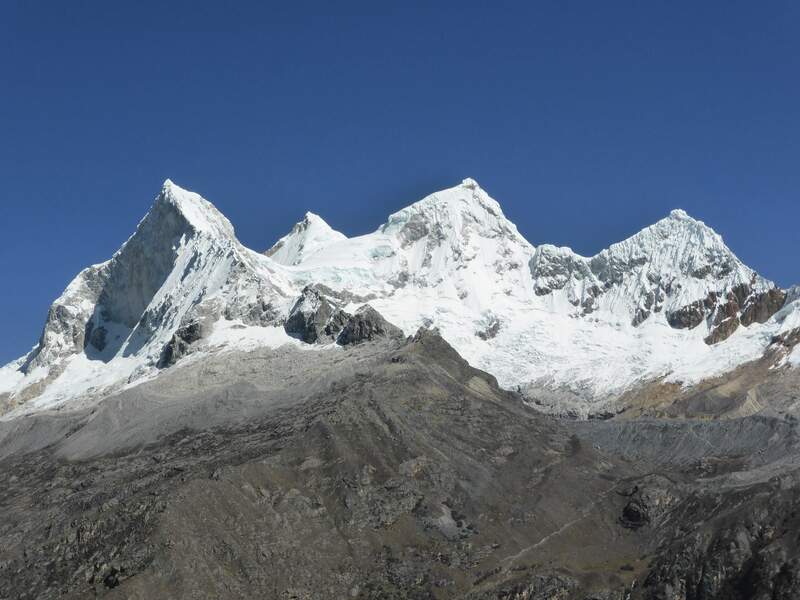 Yanapacca’s views of nearby giants like the Haundoys, Huascaran, and Chopicalqui left me with a sense of satisfaction and served to fuel my enthusiasm about revisiting Peru again. I likely won’t revisit Yanapaccha itself, but will almost certainly find myself in the Quebrada Llanganuco area again. 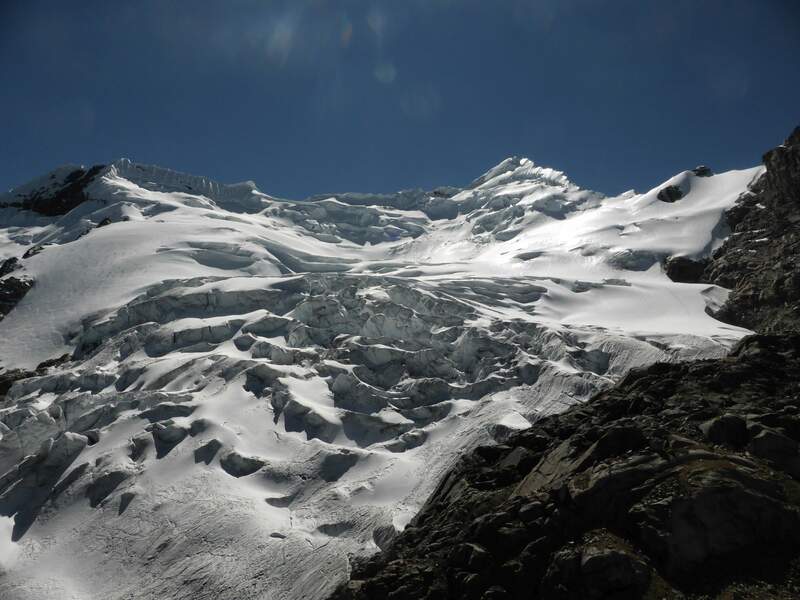 This entry was posted in Mountaineering, Peru and tagged Chacraraju, Chopicalqui, Huandoy, Huascaran, Pisco, Sunrise, Yanapaccha by Ian. Bookmark the permalink.